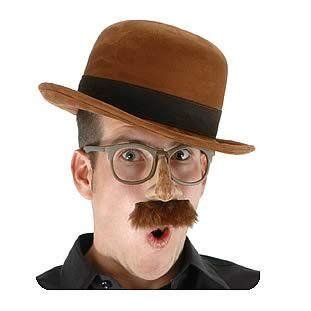 Join the retro-future world of Steampunk, with this Brown Bowler Hat! Inspired by a melding of Victorian-era Britain and the fantastical designs of authors like H.G. Wells and Jules Verne, this authentic derby-style hat is constructed of distressed ultra suede, and features a brown ribbon band. The perfect addition to your steampunk costume! One size fits most adults. This hat measures about 13-inches long. Ages 14 and up. Order yours today!